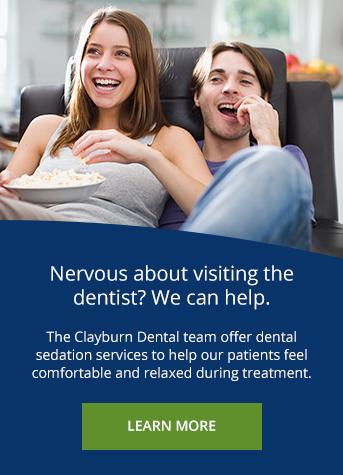 Our dentists at Clayburn Dental in Abbotsford can save your damaged and infected tooth with root canal treatment. Root canal treatment, also known as endodontic treatment, is the process of removing infected, damaged or dead pulp from your tooth. The space inside the hard layers of each tooth is called the root canal system. This system is filled with soft dental pulp made up of nerves and blood vessels that help your teeth grow and develop. When bacteria enters your tooth through deep cavities or cracks, your tooth can become abscessed. An abscessed tooth is a tooth with an infection in the pulp. If pulp becomes infected, it needs to be removed. An abscessed tooth may cause pain and/or swelling. If left untreated, an abscessed tooth can cause serious oral health problems. What are signs that I need root canal treatment? Experiencing These Symptoms? Get in touch right away to book an appointment. What are some of the main causes of inner tooth damage? Oral bacteria is the most common cause of endodontic problems. Bacteria invade the tooth pulp through tiny fissures in the teeth caused by tooth decay or injury. The resulting inflammation and bacterial infection jeopardize the affected tooth and may cause an abscess to form. When a large part of the surface or crown of the tooth has become completely detached, root canal treatment may be required. The removal of the crown portion leaves the pulp exposed, which can be debilitating, painful, and problematic. Injuries to the teeth can be caused by a direct or indirect blow to the mouth. Some injuries can cause a tooth to become luxated, or dislodged from its socket. Root canal treatment is often needed after the endodontist has stabilized the injured tooth. Root canal treatment usually takes between one and three visits to complete. Complete x-rays of the teeth will be taken and examined before the treatment begins. The space will be shaped, cleaned and filled with gutta-percha. Gutta-percha is a biocompatible material that is somewhat similar to rubber. Cement will be applied on top to ensure that the root canals are completely sealed off. Usually, a temporary filling will be placed to restore functionality to the tooth prior to the permanent restoration procedure. During the final visit, a permanent restoration or crown will be placed.